I'd like to introduce my new project endeavor, Poultry Haus. The company Poultry Haus, inspired by the acquisition of my first urban flock of chickens, is the name in which The Jewelry, The Papery, and The Coopery are operating under. 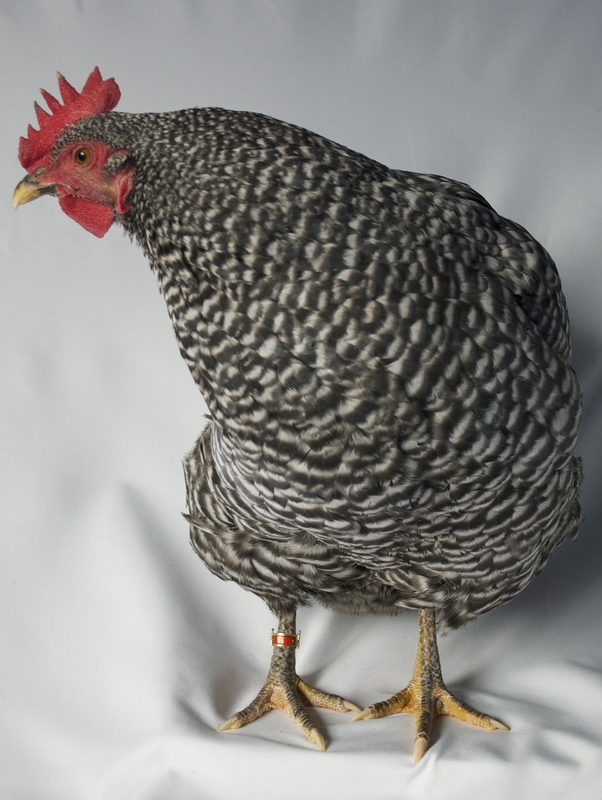 These departments of Poultry Haus will be producing products for the Chicken Fancier and the Avant-Garde Chicken in the form of their descriptive titles. The Jewelry department is the first to be in full production mode, with a projected online store opening date of February 2014! My eclectic flock of 6 chickens prompted research on chicken care and husbandry. With that, an examination of modern products for the urban chicken and its enthusiasts. I discovered that aside from your average coops, chicken feed, and the occasional chicken diaper (yes, there are chicken diapers, for your indoor pet chicken of course! ) there was a serious lack of chicken adornment in the poultry world. I thought to myself, "How's a layin' gal supposed to be an individual in this flocky-flock world! In a diaper?! I don't think so..." Thusly, Chicken Bangles were born. What is a Chicken Bangle? Besides being so much more classy than a diaper, Chicken Bangles are just that: a bangle bracelet for your finest Ladies of Laying. For me, Chicken Bangles seemed like a very natural progression to bridge my previous workings of Canine adornment into adornment for the chicken. Chicken Bangles are a fresh and handcrafted take on the traditional poultry band used in the poultry industry. Normally, poultry bands are used for simple identification purposes, and are made of bland plastic or pot metal. Alternatively, Chicken Bangles aim to give your hens emphasis on the style and class they already have. Unique and artfully crafted of precious metals and hinged for the perfect fit, Chicken Bangles are great for the entire backyard flock or your favorite pet chicken. They are functional with flare and a sure crowd pleaser to both hen and human. Chicken Bangles will be available for purchase and ready to adorn your flock at a pet boutique? gallery? feed store? soon near you! But for now, you can find them via poultryhaus.com and at our Etsy Shop! Megan McGaffigan presents her MFA Thesis Exhibition. Opening Reception: Thursday, May 16th, 2013. 6-10pm. California College of the Arts, San Francisco, CA. Has your dog passed away and you still have his/her collar and tags? Do you have extra collars laying around that your dog has outgrown? I am currently working on finalizing my MFA exhibition plans. For my show I am working to collect many dog collars (all sizes, shapes, materials, age, color, etc.) to put on display in combination with some that I have made. My MFA show aims to celebrate and bring light to the canine/human relationship and our long lasting obsession and affinity with dogs. If you wish to participate and donate or loan your collars, mark a package with your return mailing information, as well as if you would like to collar returned, or are choosing to donate. All collars wishing to be returned will be postmarked "home" by the first week of June, 2013. Should you choose to donate, these collars will be forever grouped and celebrated as a part of the body of work titled Fetch-ing by Megan McGaffigan. The work and collars will be shown May, 16, 2013 at California College of the Arts, in San Francisco at the 2013 MFA Exhibition. Link at bottom of the page! Today I took a field day to research dog shows. I attended the 111th and 112th Annual Blue Ribbon Dog Shows & Obedience Trials at the Cow Palace in San Francisco, CA put on by the Golden Gate Kennel Club. I found myself surrounded by "my people". This show seemed like a perfect time to examine social status' of humans and dogs in this particular realm of "elite" dogs. I found that the people were friendly, eager to talk about their dogs, and nurtured a healthy competitiveness centered around a pure love for a breed and dogs as a whole. Interesting to me, the stereotype of people often looking their dog seemed to hold true. Exhibitors shared information and conversed with curious members of the public who liked to share their tales of their own "regular dogs". The dogs all seemed seasoned in their demeanor: like being paraded around proudly is a daily occurrence. 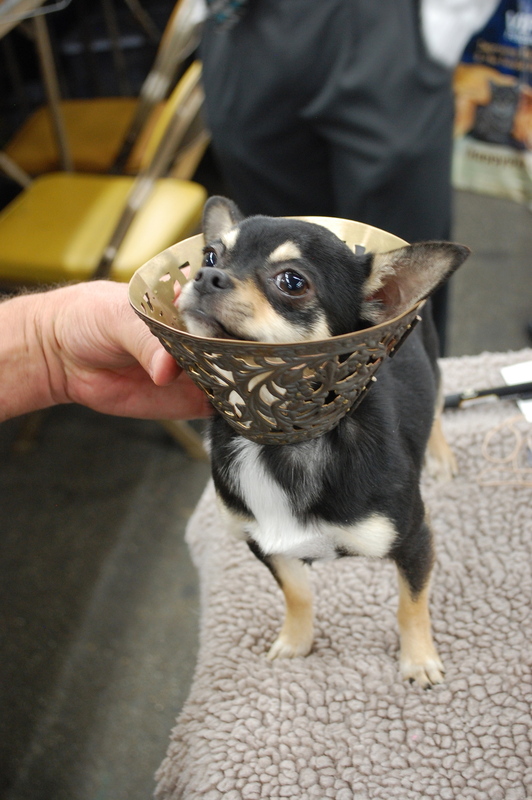 While talking to some exhibitors I came across Jeffery and Wayne of Loma Chihuahuas who were kind enough to let me test a new piece (Elizabethan Collar I, 2013) on one of their tiny dogs.